Laurel Hill is now providing a complementary cedar sachet with every purchase! The Aromatic Red Cedar sachets naturally helps to protect wool and fine fabrics from moths and other insects. Gently squeeze the sachet to refresh the wonderful cedar scent. The unique sachets are made by Disabled American Veterans. (Gift is similar to photo, but does not include metal piece – Assorted colors available). I feel like I cannot turn on the TV, open a magazine or go online without seeing or reading the words “sustainable,” “green” or “eco-friendly.” This is in no way complaining; it’s about time that we turn our ways around! Going green is the new hip thing; every corporation and household is finding some way to “go green.” Eco-friendliness is probably the healthiest trend I’ve seen in a long while, it’s far more productive than the Hummer trend! Being eco-friendly can, and should, extend into all facets of our lives, including knitting and crocheting. You can do so by using recycled yarn. You can find eco-friendly recycled yarn online, which can range anywhere from $3 to $20 a skein, or you can make your own. Andrade’s Recycling Yarn Tutorial provides easy-to-follow instructions to teach you how to make your own. And, when I say “make,” I really mean unravel an old sweater and wash it. Not only is this technique eco-friendly, but it also is easy on the wallet. Why stop at recycled yarn? Other ways you can be an eco-friendly knitter is by using second-hand tools, or swap patterns with your friends instead of purchasing new ones. Continue your green knitting makeover by hosting a yarn trading party. There are plenty of ways to help the environment while doing what you love. You will be doing your part even by adopting just one of these eco-friendly habits. So knit on, my eco-friendly friends! 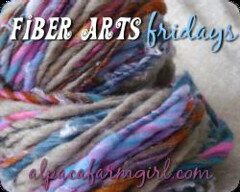 This post is included in Fiber Arts Friday! Visit Alpaca Farm Girl for more great articles!